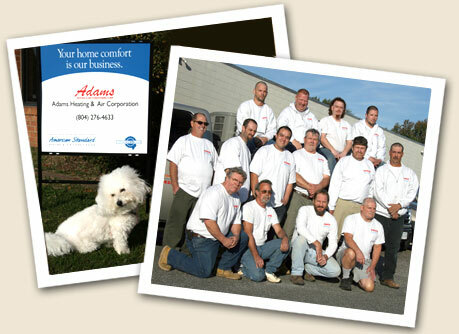 Adams Heating and Air Conditioning was formed in 1963 by Bob and Betty Adams, and is still family-owned and operated at 5770 Hull Street Road in Richmond. Adams Heating and Air Conditioning serves the central Virginia area with expert repair, maintenance and replacement of all brands of equipment. We are an American Standard Heating & Air Conditioning Customer Care dealer and the largest volume dealer of American Standard Heating & Air Conditioning products since 2007. Our employees are factory trained and strive to provide the highest level of service to our customers. The sales and service teams at Adams are ready to visit your home, evaluate your heating, cooling, and indoor air quality needs, and recommend the right products for your family and budget. Call today for a free replacement estimate or click here to prequalify for financing.